Word is all three pods are inbound together from the Strait of Juan de Fuca. I'm out on the boat this afternoon (I can't wait! 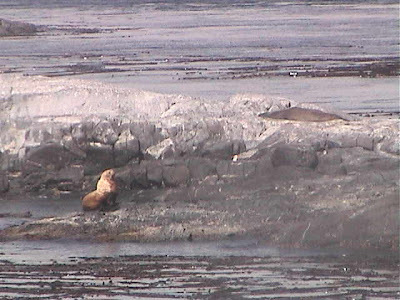 ), but since I heard they were near Race Rocks I decided to check out their web video cams to see what I could see. There is a 360 degree camera that you can control, and using that I saw a huge family group of whales pass close to Race Rocks! It's a very user friendly camera, and they even have a nifty screen capture button so you can download stills to your computer. Unfortunately due to the delay I was unable to capture a photo of the orcas all surfacing together, but I did manage to get a shot of a slightly more cooperative Stellar sea lion. I'm sure there will be more to post later after (hopefully) encountering the superpod this afternoon!! !